The verdant rolling hills that evade being corralled by white washed plank or stone fences that stretch for miles... Glimpses of a mare and her foal in the morning sun... Hollows that look as if untouched by the hand of man... Natural beauty abounds, with Metropolitan New South cities melting into rural communities, where all can relax and enjoy the feeling of bluegrass on bare feet and the joyful sound of Bluegrass music... You are now in Kentucky. Welcome! 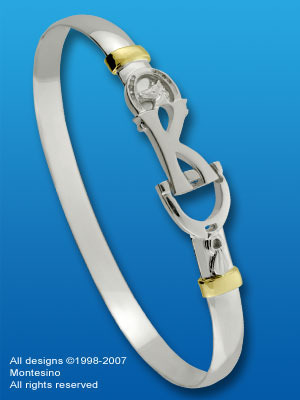 The Kentucky Hook BraceletTM is a tribute in precious metals to the gloriously diverse 15th state of our country. With equestrian symbolism a "Y" formed by the shape of a stirrup, is "hooked" by a "K" crowned with a horseshoe motif, with the union of the two symbolizing the "hook" that Kentucky has on the hearts of millions. Two 14 karat gold wraps signify Bluegrass and Bourbon, two more recognized legacies of "The Bluegrass State". Come and enjoy...for a week or a lifetime of weeks and let the Kentucky Hook BraceletTM be your key to this fair state.